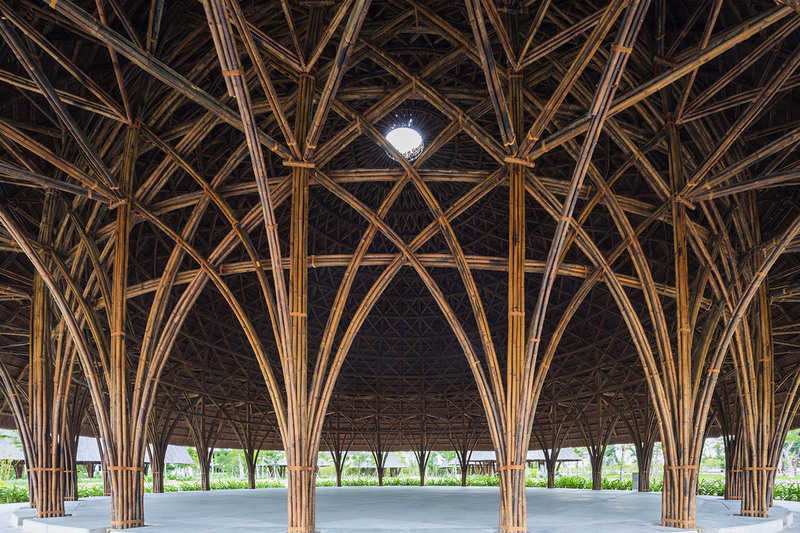 Nobody does bamboo architecture like Vo Trong Nghia Architects. The firm recently released new photos of eight bamboo domes rising on an islet on Saigon River in Vietnam. The completed structures comprise part of a multifunctional community center for the Diamond Island project, a series of large and small spaces for local residents to use as venues for various events and activities. 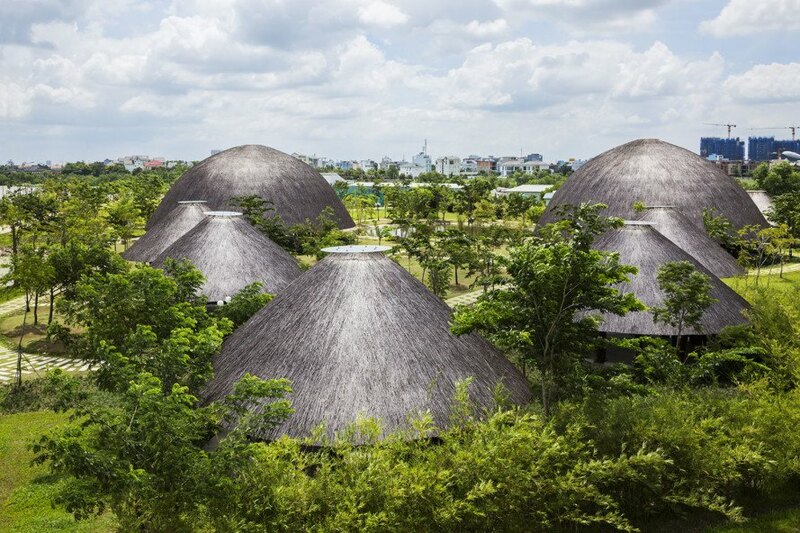 Inspired by traditional bamboo baskets used by Vietnamese farmers to shelter fowl, the structures dominate the site with a complex of bamboo domes varying in length and height. The Diamond Island Community Center is located on a Saigon River peninsula east of Ho Chi Minh City and makes use of an empty area going through a gradual development program. Scattered throughout the park, the domes measure from 7 to 12.5 meters in height, with a maximum radius of 24 meters. The smaller structures are conic in shape, while the bigger ones resemble giant mushrooms. Thatched roofs are supported by a complex bamboo structure resting on columns at ground level, extending up where the entire structure is further strengthened with large bamboo rings. The thick roof surfaces have centrally positioned round skylights that provide additional natural lighting and ensure optimal ventilation. Inspired by traditional bamboo baskets used by Vietnamese farmers to shelter fowl, the dome structures dominate the site with a complex of structures with varying heights and length. The Diamond Island Community Center is located on a Saigon River peninsula east of Ho Chi Minh City and makes use of an empty area going through a gradual development program. Scattered throughout the park, the domes measure 7 to 12.5 meters in height, with a maximum radius of 24 meters. The smaller structures are conic in shape, while the bigger ones resemble giant mushrooms. Thatched roofs are supported by a complex bamboo structure resting on columns at ground level extending up where the entire structure is further strengthened with large bamboo rings. The thick roof surfaces have centrally positioned round skylights which provide additional natural lighting and ensure optimal natural ventilation. Local workers built the two large pavilions, while the smaller ones were prefabricated and then assembled on site. Each of the smaller structures consists of 12 prefabricated structural units. "The large pavilions are double-layered dome structures," said the studio. 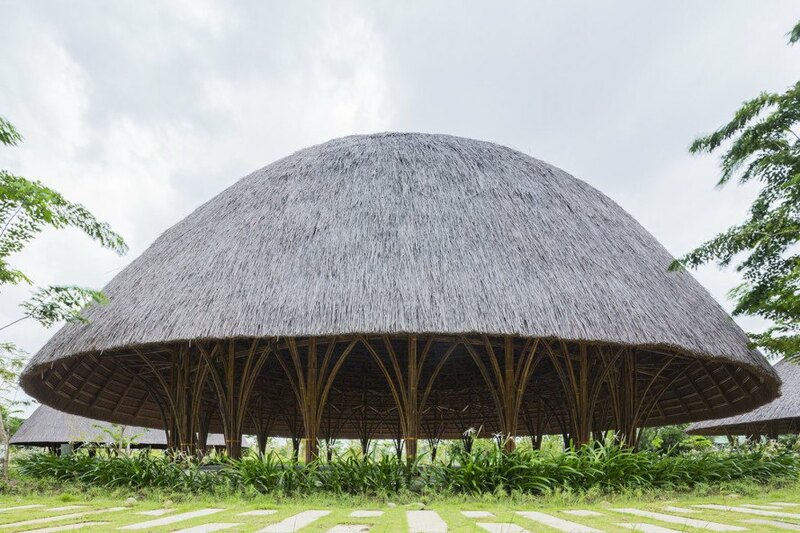 The outer roof layer of thatch overhangs from the inner basket-like structure to create deep eaves, protecting the whole bamboo structure from harsh sunshine and heavy rainfall."